LDT-007BN for low-power Nd:YAG lasers converts IR radiation of 700 nm to 1400 nm into visible red light of 654 nm. 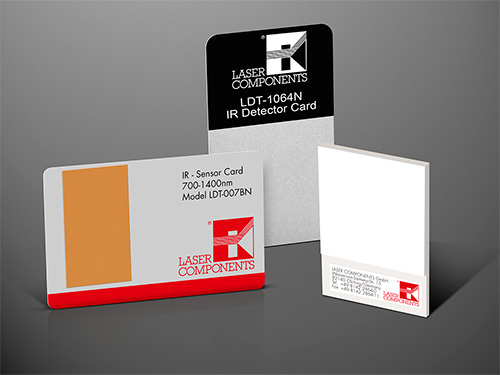 LDT-1064CN made of resistant ceramic is suitable for high-power IR lasers (900-1100 nm) up to 200 W/cm2. The area of 60 mm x 40 mm can be used up to the edge. LDT-1064N offers a particularly large area of 50.8 mm x 50.8 mm and can also make the invisible radiation of IR lasers (800-1700 nm) with larger diameters visible as green light (530 nm). All screens are ready to use immediately and do not have to be activated. Upon request, we will be happy to supply you with a sample to test the screens in practical applications. Company: LASER COMPONENTS USA Inc.